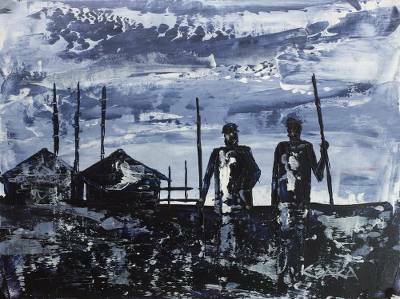 Signed Impressionist Painting of Villagers from Ghana, "The Watchmen"
Inspired by a quotidian village scene from Bongo, Ghana, artist K. Baka paints this composition with an impressionistic style. The silhouettes of two villagers are depicted alongside their homes, framed against a cloudy sky. These men serve as volunteer watchmen, protecting their village from thieves. K. Baka has received 5 microcredit loans with 0% interest from Kiva and Novica, the first for $1000 and the most recent for $500. Proceeds were used to invest in the purchase of dyes and cotton fabric for continued production. "For my paintings, many a time I see them in dreams and visions before I actually paint them. So in the morning I organize my materials and start painting." Artist K. Baka has been featured in Red Herring magazine. "My name is Kwabena Kufuor Afriyie-Addo Jr. (also known as K. Baka). I was born on Tuesday, July 2, 1968 in the eastern region of Ghana. My father is Benjamin Kwabena Kufuor Afriyie-Addo and my mother is Nancy Afriyie-Addo. "When I was a child, I used to draw a lot. I was so interested in art that in school it was the subject I got the highest marks for. Actually, it was a gift - a talent. I later entered art college for a three year diploma in art. After graduation, I established my studio in the house. While in school, I was painting and selling, so after school I did not need to undergo any brush-up or polishing. I do paintings, craftwork, billboards, screen-printing and signboards. In 1997, I had 20 students whom I taught painting, batik, and textile making. Also, many art students come to me for brushing or polishing. Presently I have two apprentices. "My paintings are natural, and I try to use inexpensive but high-quality material like calico, denim, military camp tents, and heavy curtain cloths. I find they are stronger than canvas. It also makes it possible to sell my works to a larger audience. I use acrylic paint because it dries faster and it lasts longer. I use phone cards for the painting instead of brushes because it gives me the effect that I want. For my paintings, many a time I see them in dreams and visions before I actually paint them. So in the morning I organize my materials and start painting. "I am not a rastafarian. What I am wearing are simply dreadlocks. I am not married but I have a young son." Looks great on my wall! I purchased Elephant Child. Not only is it more beautiful in person, it also creates a great energy in the room. It is officially the coolest thing on my wall, and I have lots of cool things on my walls. I highly recommend this exquisite tapestry to anyone who loves elephants like I do. To date, NOVICA has sent $90,892,074 to artisans!